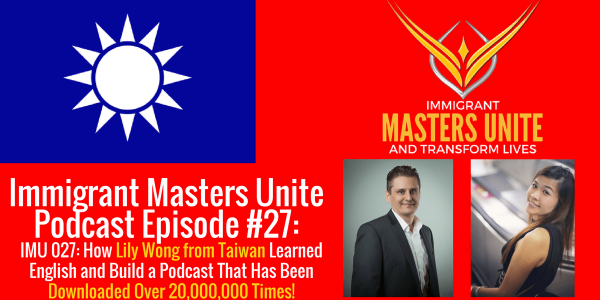 IMU 027: How Lily Wong from Taiwan Learned English and Built a Podcast That Has Been Downloaded Over 20 Million Times! | Immigrant Masters Unite Podcast: Transform Your Business, Life and The World Around You! What if I told you that you don’t need to go to school to learn English? What if I told you that you don’t need to buy a course or someone else teaching you the language? Well, that’s exactly what Lily Wong did! And she created a podcast in Asia that has been downloaded over 20,000,000 times! That’s 20 million! Want to know how? Then listen to this episode of Immigrant Masters Unite! This is Polish Peter and welcome to episode 27. Today, I have Lily Wong who I’ve recently met at Podfest 2017 in Orlando. Lily has an amazing story to share with the world. Like many people, she had to overcome some of the biggest hurdles life throws at us and yet, she has come out stronger than ever! How Lily learned English by listening to podcasts! That’s right, she did not have a teacher or a course. Listen and you’ll hear Lily talk about how she overcame some beliefs about it, adversities and was inspired to create a podcast that in 2 1/2 years, has been downloaded over 20,000,000 times! How she stepped out of her shell of being a shy introvert to a powerful extrovert that allows her not only to talk with anyone at anytime and anywhere but she is now able to speak on big stages! In fact, when I meet Lily in Orlando at Podfest 2017, she was speaking on a stage in front of few hundred people! How Lily was able to start a podcast from nothing to being one of the biggest podcasts in her niche. In fact, just 2 1/2 years later, that podcast has been downloaded over 20 million times! Listen and you’ll hear how she never quits but stops frequently, how she creates relationships on a spot and the factors that contribute to her ongoing success! And all of that was recorded on a sailboat in St. Petersburg, FL!